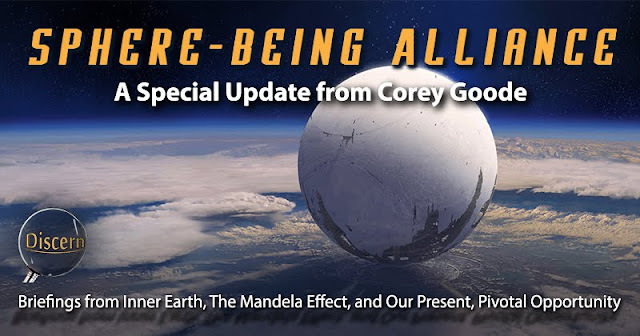 Below is the latest update from Corey Goode. 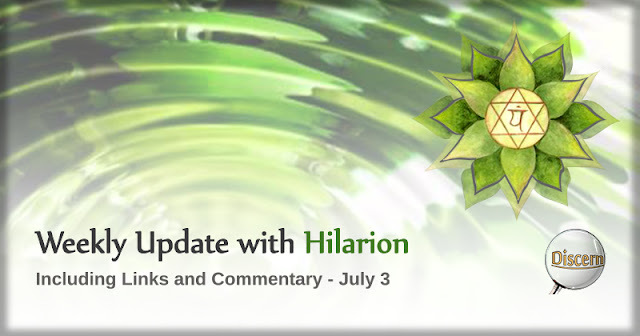 This update signifies a very pivotal moment within our current timeline, and may represent a crucial opportunity to create a future reality which all of us desire to see in this world. This timeline is to be beneficial to all, and will respect all as equal and divine beings within this galaxy. To these ends, it is up to each of us to ensure that we have the most positive, and most forwardly progressive focus possible. In doing this, we ensure our timeline to be the greatest and highest path for us all. With that here is the update from Corey Goode. As we have seen within past episodes, there has recently been a steady stream of soft disclosures dispensed by the corporate media. It seems that this quickening of revelations within a historically secretive and underhanded establishment is leading to something big. 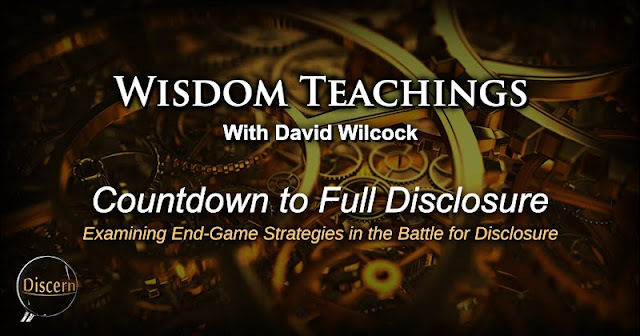 Though the cabal responsible for this secrecy may not be willing to completely relinquish their hold on the undoctored truth, the revelation of Full Disclosure could easily be considered an inevitability. 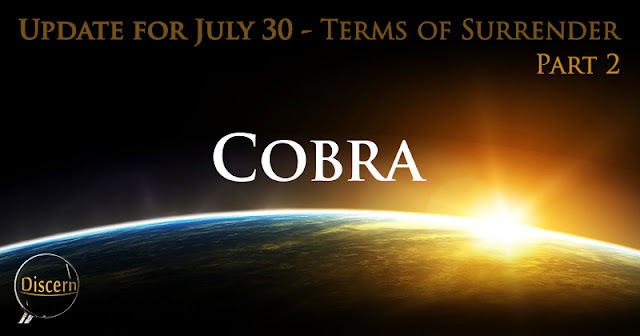 Cobra - Update for July 30 - "Terms of Surrender Update"
First, the mass arrest plan is still valid and in full force. 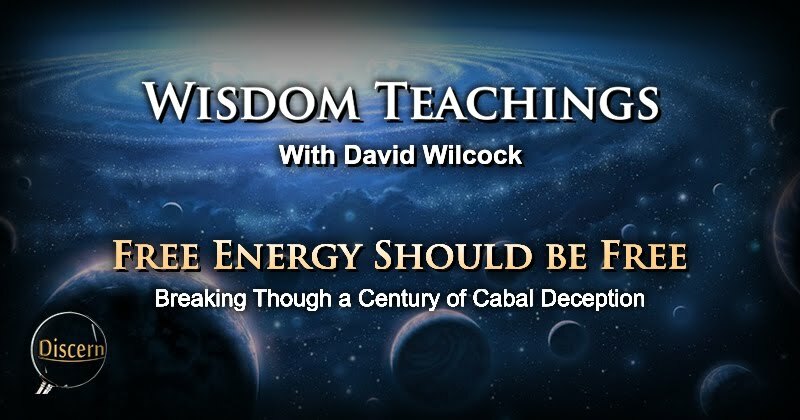 The Light forces will not wait for any dark individual or Cabal faction to surrender, they will arrest them as soon as they can do that in a way that is safe for humanity to go through the transition. The Event--many of us have heard of this moment. This occurrence is said to represent very rapid and profound changes in human and planetary evolution, and to mark a dynamic, multidimensional transition within our galaxy as a whole. We have heard this ascension event prophesied and predicted from sources dating back from decades to millennia. Here in modern times, we have been given general detail about this monumental moment, but what is it, and why has it been predicted to happen by so many various sources? These are common questions among many, and their answers have been given in short. Let's get down to the details. This update from Cobra covers the latest from the conference in Taiwan, as well as the latest intelligence on the attempted coup on the Turkish government. Following this update, we will discuss a few key points on the information Cobra shares. 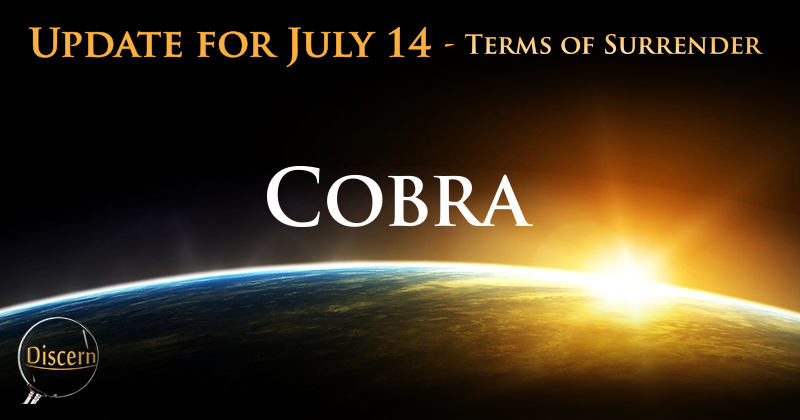 With that, here is Cobra. 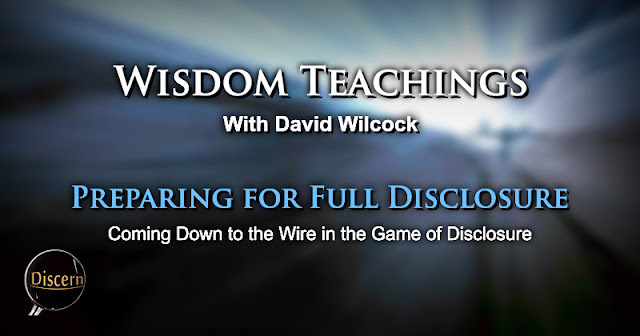 In this episode of Wisdom Teachings, we learn that there is much more to the situation of disclosure than past episodes have revealed. 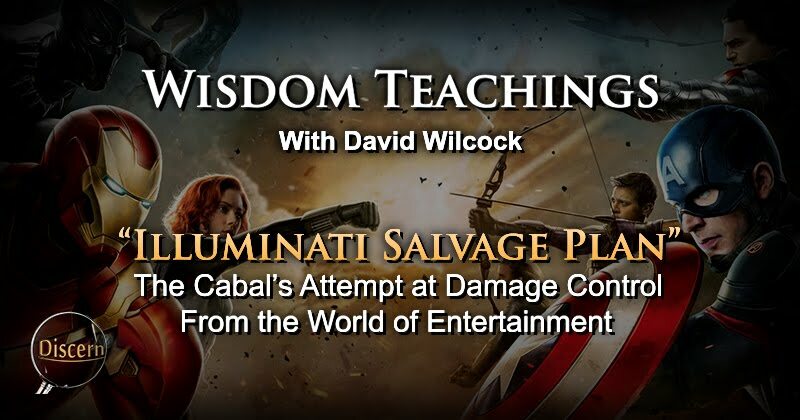 Within the discussion, David Wilcock continues his exposé on the most remarkable events to hit the news in the year of 2015. The discussion proved that the farther we get into the revelations of last year, the more remarkable they seem. It can be particularly intriguing to hear the different experiences which Corey Goode has shared over time. These encounters may seem somewhat alien to many of us. However, we may realize that if what we have heard from recent intelligence is true, these experiences will not simply be occurring for a couple of people, they will be the common-place experiences of many of us (of the more pleasant type, I imagine). This episode of Wisdom Teachings was one which revealed the fact that the disclosure process is presently leaving little to the imagination. 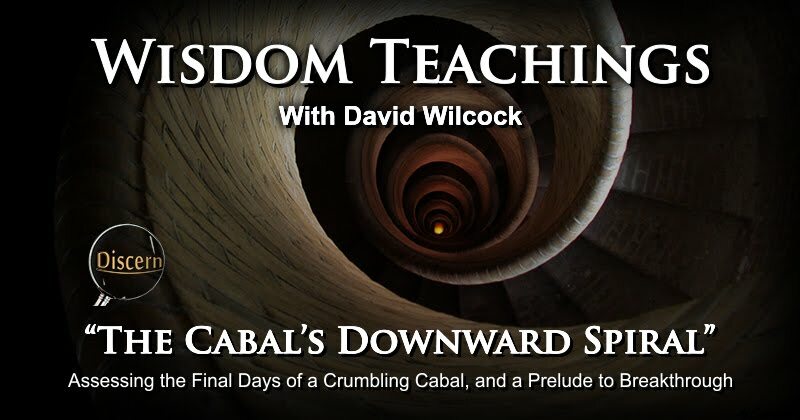 At this point, the race for disclosure is reaching its final stretch, and in my view, it is pretty undeniable where the cabal is attempting to take the narrative even as they make their way to total defeat. This announcement from Cobra verifies much of the sentiment I have had for some time now. If this is true, then this announcement is very big, and needs little introduction. However, at the end, I will share a few suggestions on how we might proceed forward with the most positive intent possible. Over the past few days and weeks, events have been culminated to what is likely to be an ultimate, crescendo of positive change world-wide. 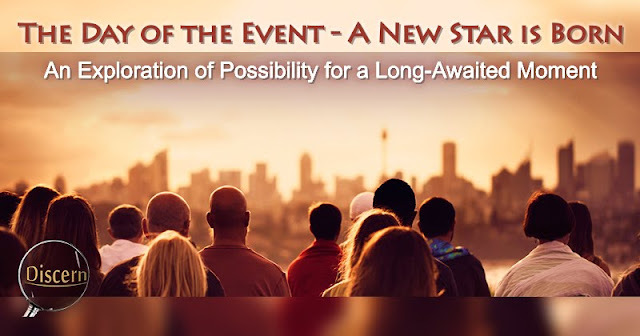 We see numerous announcements ranging from extremely positive to seemingly devastating, and many of us may not know what to make of this labyrinth of events. 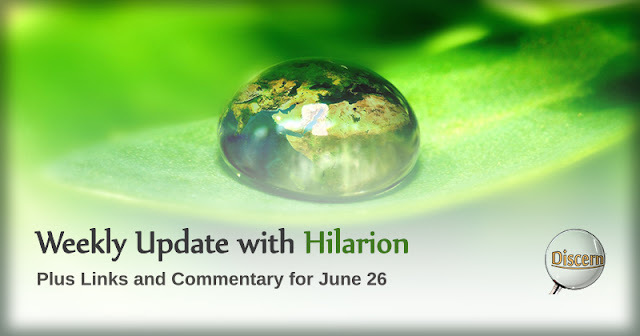 This article is intended to give perspective on numerous world events as we see them unfolding, as well as to help each of us to contribute to these events our own positive intent. 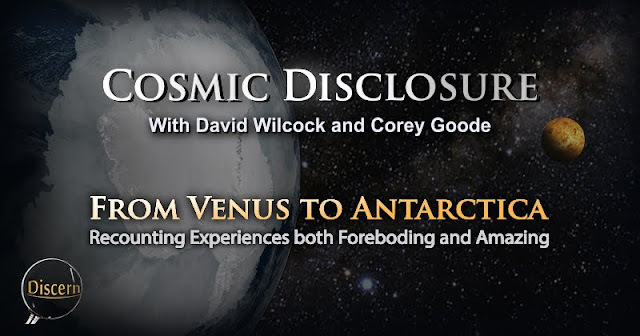 It seems that the road to Full Disclosure is just as eventful as the disclosure event itself is likely to be. We have been through numerous events and revelations, all of which have opened our eyes and our minds to new possibilities. As we have observes, the Positive Earth Alliance has been strategically dismantling the cabal's control structure piece by piece. 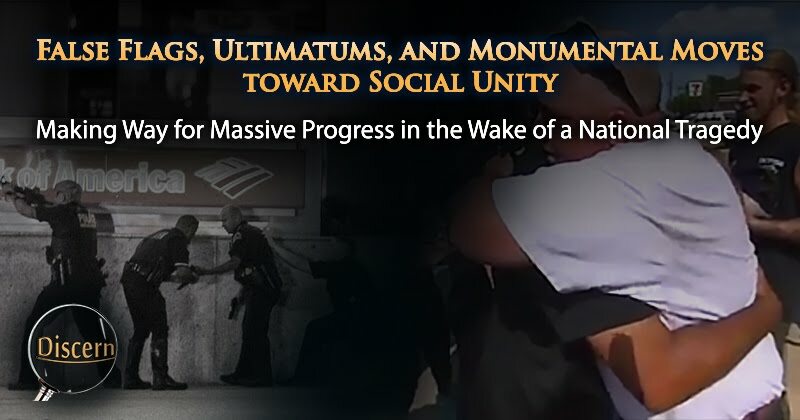 We find this Alliance taking one step after another toward awakening the masses to the existence and influence of this crime syndicate, disclosing cabal secrets left and right, and continually presenting better alternatives to their former draconian, anti-humanistic control. The contrast between this episode of Cosmic Disclosure and the last episode was fairly significant, and partially demonstrates why I find the series appealing. 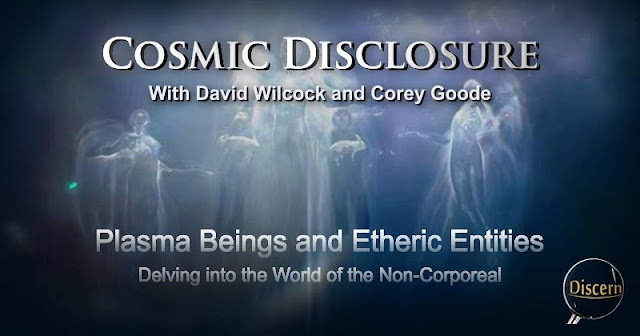 On one end, we have the more familiar testimony relative to our own natural and supernatural abilities, and the experiences we have here on Earth. On the other end, we have these other-worldly accounts, which even though we may not have shared in these exact experiences, these accounts capture our imagination, and help us to picture a world not yet familiar to us. 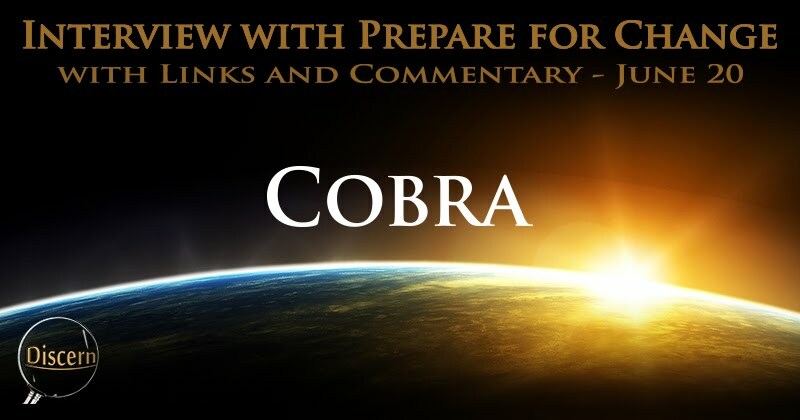 This article includes the June 20th interview with Cobra and the Prepare for Change organization. Within it, Cobra answers a number of questions never before addressed, and also raises a few more. (It seems that we will be able to hear those particular answers at a later time.) For right now, we are presented with an intriguing discussion of the current state of affairs on planet Earth and beyond. 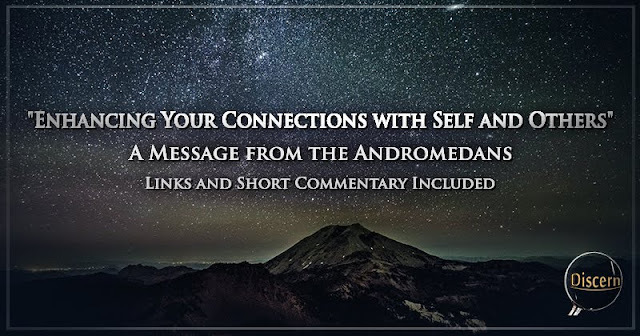 This is a channeled message from the Andromedans through Natalie Glasson. It seems to hold within it valuable observations and advice for appreciating the self, as well as each instance in which we interact with other souls. I typically comment on such material. However, this message was so thorough, and so concise, I was left with very little to say. It was an overall pleasant and inspiring message to consider. You are the holders of the highest frequency that is available on the planet and this requires the constancy to remain true to yourselves no matter what situations you encounter in your life. 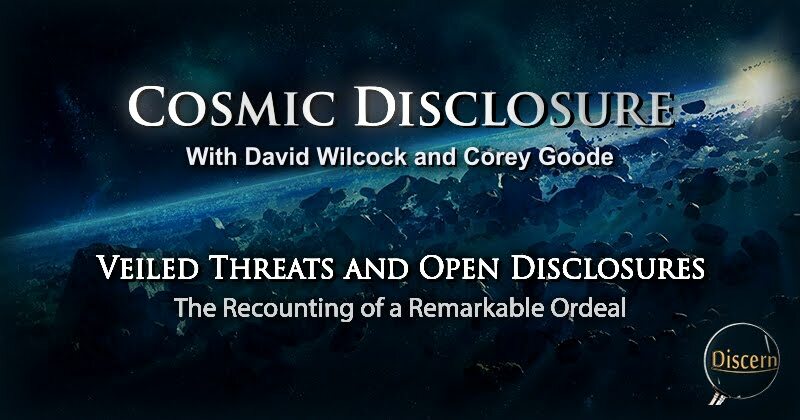 Throughout much of the Cosmic Disclosure series I have been able to say that I could somewhat relate to the subject-matters discussed (aside from the astounding testimony we hear on the subject of off-world operations). Each episode tends to have a certain draw and familiarity to it for myself (as well as many others, I'm sure). This is partially because many of the topics within these episodes can related with our own life experiences to some extent. However, for myself, this episode went above and beyond any previous expectation. The Wisdom Teachings series has covered quite a variety of topics over time, and all of them have their high-points about them. Some focus on informing the audience on the vast infrastructure which has been built off planet, while others focus on the history of the human race here on the surface. Some episodes focus on the battle between the negative “Powers-that-Were” and the positive Earth Alliance, and at the same time, give insight into the role each of us plays in our planetary liberation. (Though, if you've been watching the series, you're already aware of this.) This episode, The Cabal’s Downward Spiral, was unique, I feel, as it marks a new state of affairs on planet Earth.